For migrants, language can be among their biggest challenges. If they don’t know where in the world they will end up, how can they know which language to master? And where do they begin? Glodie Makunda of The Congo teaches English to migrants on the Greek island of Lesbos. He strives to transform English from a hurdle into a path to self-expression. Podcast by Alice Crites. 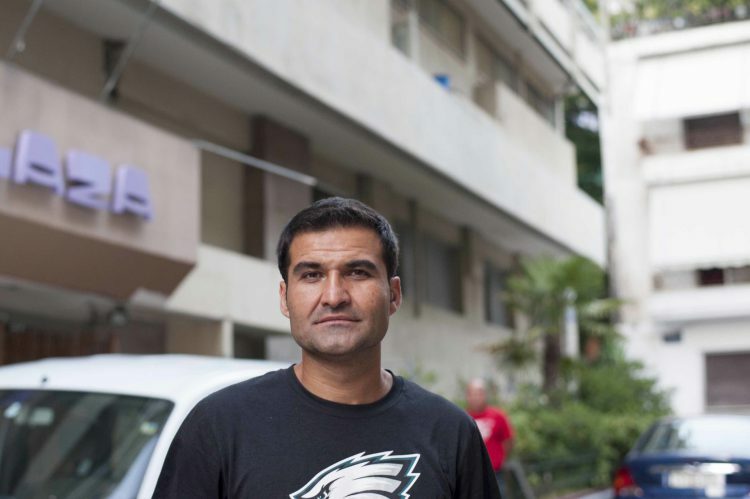 Migrant Abdul Rahman, outside his home in an illegal “squat” in Athens, Greece. MYTILENE, Greece– Late last year, Mohamad Hassan Atye arrived on the Greek island of Lesbos confused, lost and unsure. Atye works as an interpreter at Mosaik, a community center that teaches new languages to migrants in Mytilene, the capital of Lesbos. Finding a job allowed him to rent an apartment, which he said was much better than living in one of the island’s refugee camps. “The life is not easy in the camp,” Atye said on July 11. The day before, migrants had rioted and set fire to the trailer of an aid group in the Moria camp, five miles down the road from Mytilene. Atye lived in Moria before he found a job as a translator. 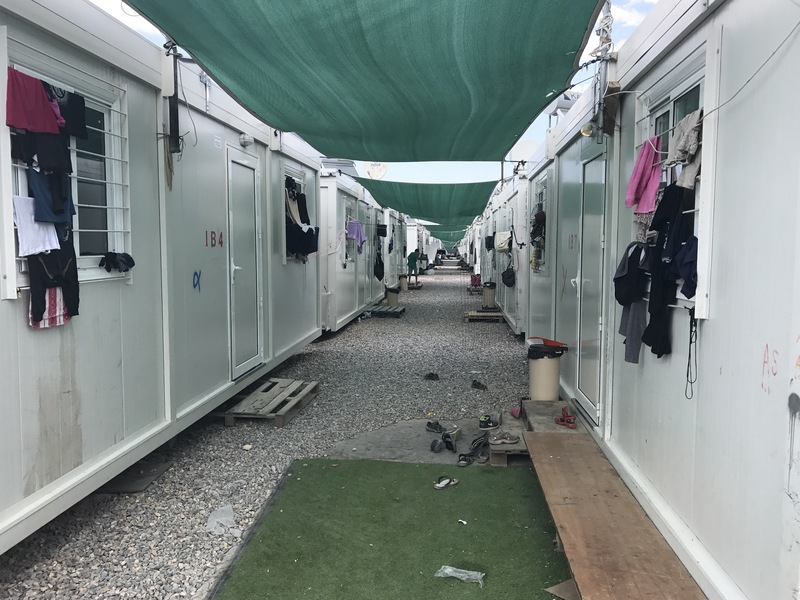 Atye and other migrants who have found work as translators for aid organizations represent a rare bright spot amid gloomy employment prospects for recently arrived migrants in Greece. Many migrants have struggled to integrate into Greek society, according to interviews with more than a dozen migrants, aid workers, and experts on migrant integration. Mustafa Balqes’ café in Skaramagas migrant camp. Mustafa Balqes is a 26-year-old Syrian who opened a café in Skaramagas migrant camp in July. 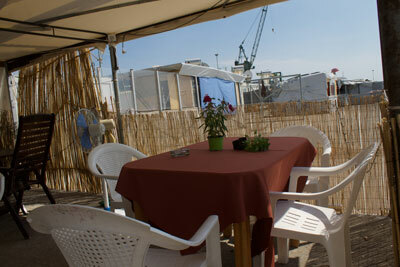 Surrounded by bamboo fences and stocked with new wooden tables, his café adds color to the stark camp. Pink flowers on the tables frame the view of the Aegean Sea. He installed a foosball and pool table in one tent, and surround-sound speakers in the other. If you ignore the United Nations tarp, you might forget for a moment that you’re in a migrant camp. The UN High Commission for Refugees (UNHCR) estimates that nearly 50,000 migrants are still in Greece, awaiting asylum interviews in which they will make their cases for staying in Europe. Many migrants have been in camps for more than a year and still have months to go before their asylum cases are processed. Isolated from tourists and locals, counting dwindling savings and unstructured days, many migrants remain without jobs and little way to productively fill their days. But a few lucky migrants have found work in camps—or even, like Balqes, have started their own businesses. The set-up was a major investment: Balqes said the pool table cost about 1750 euros (about $2,070), the billiard balls were another 750 euros ($890), and the rest of it—matching wooden tables and chairs, tablecloths, the coffeemaker—were another 1,000 euros ($1,180). Charging one euro ($1.18) for a game of pool, and one euro for a cup of coffee, just breaking even seemed like a distant future. In recent years, more than 1 million migrants have floated across the Aegean Sea from Turkey to Greece, landing on the island of Lesbos. Hundreds of their boats happened to wash ashore on a small tourist beach directly behind the Aphrodite Hotel. The Aphrodite Hotel has 53 rooms, a pool, a taverna and a spa. The Vita family, which runs the hotel, was caught flat footed when the unexpected guests suddenly began arriving two years ago. On some days, as many as eight boatloads of migrants arrived on the tiny spit of sand, according to Aphrodite Vati Mariola, for whom the hotel is named. Many came from Syria, Afghanistan and Iraq. Mothers, fathers and children traveling alone were fleeing war, persecution and economic instability. 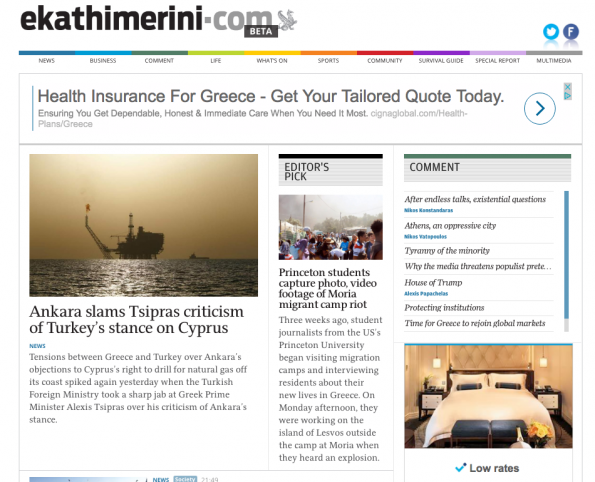 The hotel didn’t receive government or charity support between April and August 2015, Mariola said. Hotel guests would help them attend to the needs of the migrants when they arrived, and clean up the leftover clothes and life jackets that were cast aside on the beach. When European coast guard ships began patrolling the area, the migrants stopped arriving. But the impact on the hotel continues, Mariola said. In 2015, before the crisis, 7,989 guests stayed at the hotel, she said. In 2006, at the height of the crisis, tourists stayed away and the number of guests plummeted to 2,911, a 64 percent drop. Mariola explained that many other local shops, restaurants and hotels experienced a similar decline in business, because tourists were afraid of coming to the island. Now, they are trying to spread word they are still open for business. 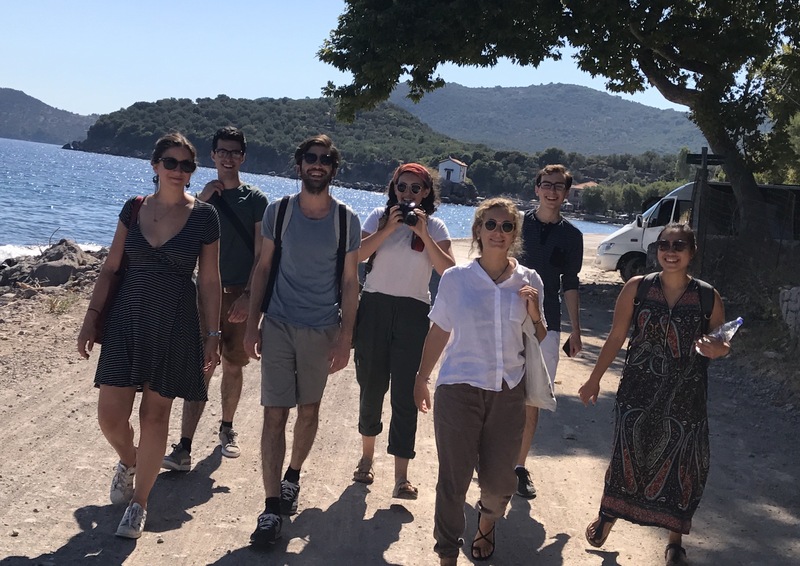 Princeton Alumni Weekly magazine recently spoke with journalists Talya Nevins and Alice Maiden, and wove the lessons they shared about their work in Greece into a podcast. 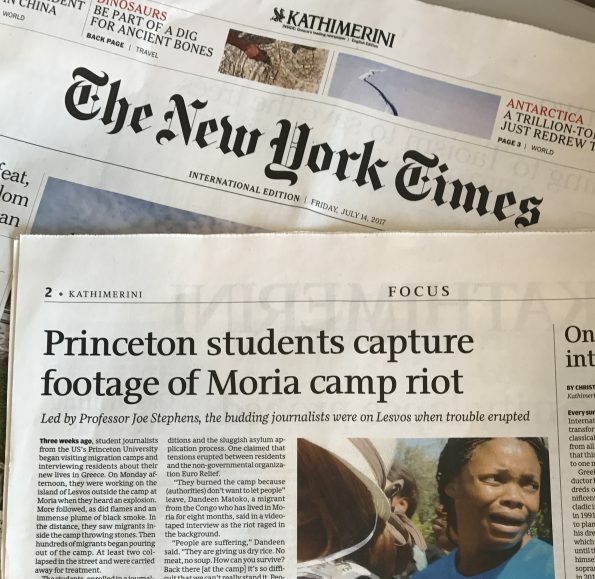 On July 10, migrants living in a camp near the town of Moria on the Greek island of Lesbos demonstrated against their deteriorating living conditions. Then things got out of hand. Our video team was there.